This site is not responsible for any ads appearing here; you click on them at your own risk. BARBADOS' 50 th ANNIVERSARY SONG. YOUR GO TO SONG. A MUST LISTEN. For Recent Posts go to Updates page. Welcome to this site which was set up to provide news and information for persons, from the Blades Hill/ St. Mark's area, who are now living abroad. Those of you who find this site useful can show your appreciation of the effort put into keeping you informed by purchasing a copy of the book "Morals and Values for Living", "From Bajan to Standard English", 'Highlighting the Issues or "Essential Words and Meanings" by E. Jerome Davis,on Amazon. AGAIN I ENCOURAGE YOU TO SUPPORT LOCAL AUTHORS BY GIVING A BOOK . I AM SURE YOU WILL BE WONDERING WHAT TO GIVE YOUR SON, DAUGHTER, NIECE, NEPHEW, COUSIN, FRIEND. WELL WONDER NO MORE. MY BOOKS ARE AVAILABLE ON AMAZON or AT DAYS BOOKS . The preview of "From Bajan to Standard English " on Amazon will not give a good insight into the contents of the book. The extracts below offer a better insight. Gih muh dah day Give me that. Wuh part you is Where are you? Wuh you want? What do you want? I in know. I do not know. Wheh you gine? Where are you going? Dah in mine . That is not mine. Hole dat for muh. Hold that for me. I tell he so. I told him so. I see she yesterday. I saw her yesterday. Gih muh dah day. Give me that. I in got none. I do not have any. Cah it long. Carry it along. Wuh part you is? Where are you? Stan day! Doan move! Stay there! Don’t move! Shut yuh mout. Shut your mouth. You call me? Did you call me? Weh it is? Where is it? Weh you gine? Where are you going? Nuh body in call you. Nobody called you. Lef dah lone. Leave that. I doan see-e nuh mo. I do not see him anymore. Weh you from? Where do you live? Somebody cah it way. Somebody stole it. Dem in nuh good. They are no good. It doan work. It does not work. Lef it day. Leave it there. De bus brek down. The bus broke down. I cahn get it do. I can’t do it. I cahn fine it. I can’t find it. I cuhn fine it. I could not find it. De bus gone long. The bus has gone. He got nuff money. He has a lot of money. I real hungry. I am very hungry. Me head hurting me. My head is hurting. Dah is true. That is true. Dah in nuh true. That is not true. Dah in mine. That is not mine. Wuh wrong wid you? What is wrong with you? Hole dah fuh muh. Hold that for me. I in want nuh mo. I don’t want any more. Ope it in. Open it. Awn it do. Undo it. It mash up. It is not working. Who seh so? Who said so? Who wun dah is? Whose is that? I fuhget dah day. I forgot that. Doan guh day. Don’t go there. Move from long day so. Move from there. I gaw guh town. I have to go to town. You is mek me laugh. You make me laugh. Skin out de bag. Empty the bag. I don’t go there any more. The shop doan open pun a Sundi.(Bajan). The shop is not open on a Sunday. I am not the only one who did it. I have to get my nails done. There is no money on my phone. o adjectives repeated once or twice. The sun hot, hot, hot. 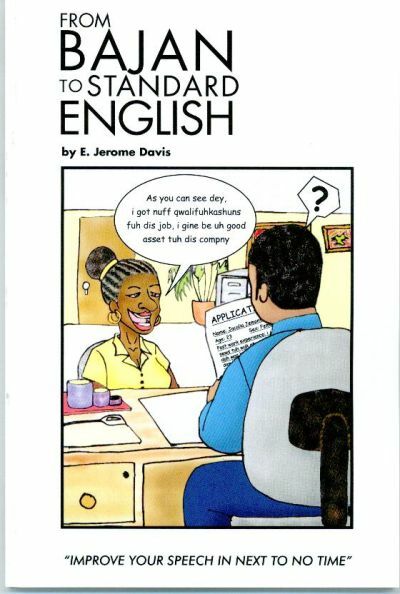 Get the book "From Bajan to Standard English" for a comprehensive presentation.. also available "Understanding Bajan Dialect - for Tourists and Visitors to Barbados. "EVIL WILL PREVAIL IF GOOD MEN DO NOTHING"
Disclaimer: Information on this site is purely to serve the interests of visitors.Every effort has been made to ensure that the information on this web site is accurate.However, the owner of this homepage and the portal is not liable for any consequences, legal or otherwise, arising out of the use of any such information. There have been 22 visitors (60 hits) to this page today. Updated and current.